Definition at line 63 of file util-debug-filters.h. Definition at line 64 of file util-debug-filters.h. 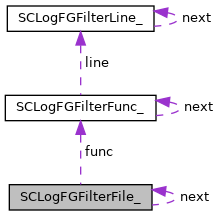 Referenced by SCLogAddToFGFFileList(), SCLogPrintFGFilters(), and SCLogReleaseFGFilters(). Definition at line 65 of file util-debug-filters.h. Definition at line 67 of file util-debug-filters.h.